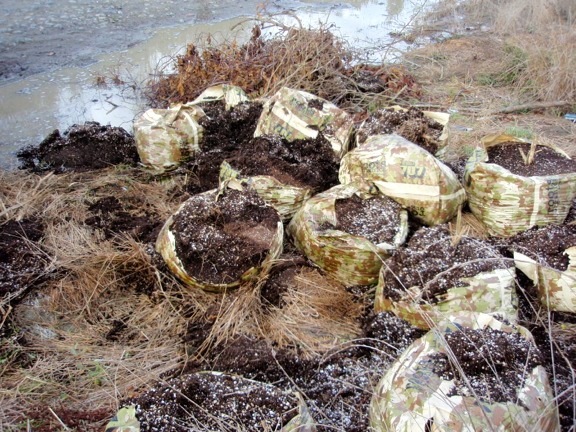 EEL RIVER – More than a ton of used marijuana grow soil that had been illegally dumped on the bank of the Eel River near Ferndale was cleaned up and hauled away last week. Approximately 30 bags of soil were taken to Wes Green Landscape Materials in Arcata, one of the local facilities that will accept spent soil like this for a fee. Soil that has been used in marijuana growing operations is often high in added nutrients such as nitrogen, phosphorous and potassium, said Melissa Martel, director of the Department of Health and Human Services’ Division of Environmental Health (DEH). It becomes detrimental to the environment when it’s allowed to filter into waterways. Blue-green algae looks like green, blue-green, white or brown scum, foam or mats floating on the water, she said. These floating algae masses, or “blooms,” can produce potent natural toxins. Dogs and children are most likely to be affected because of their smaller body size and tendency to stay in the water for longer periods. Human activities can dramatically affect nutrient levels and water flows in rivers, streams and lakes, Martel said. People are advised to be conservative with the use of fertilizers and pesticides on their lawn, garden or agricultural operation and also to recycle spent soil that has been used for intensive growing by tilling it back into gardens or protecting it from rainfall to avoid nutrient runoff. Staffers with DEH’s Solid Waste Local Enforcement Agency Program perform a variety of services, including investigating illegal dumping. Martel says DEH has seen an increase in the amount of waste in general that is discarded illegally adjacent to rivers, in wooded areas, along roadsides and in other areas throughout the county. Samoa, Loleta and parts of Blue Lake have been particularly hard hit, she said. There are things people can do to help keep the environment free of excess trash and other waste products. “We encourage people to handle things the right way,” Martel said. “The best management method for spent soil is reuse. Growing vegetable crops in this high-nutrient soil, or mixing it with other soil, may result in high yields. Some gardeners prefer not to use it if they don’t know the strength or type of nutrients it contains. Otherwise, you can pay a fee to use a compost facility like Wes Green Landscape Materials or one of the county’s transfer stations. So, what should people do if they see that illegal dumping has already taken place? For more information, contact the Division of Environmental Health at (707) 445-6215 or 1-800-963-9241. This entry was posted on Sunday, November 4th, 2012 at 11:12 am	and is filed under News, Environment. You can follow any responses to this entry through the RSS 2.0 feed.